Gas heating is the fastest way to heat your pool or spa. Typically, a gas heater will use either natural gas or LPG, and there is absolutely no difference in the efficiency of both systems. When choosing a swimming pool gas heater, it’s always better to choose the next size up if that’s available because a larger system will ensure faster recovery times after bad weather while placing less strain on the gas heater itself. We recommend two different, equally great brands of gas heaters; Raypak and Zodiac. Both brands offer a range of heaters that are suitable for most pools or spas; however, the Raypak range is larger and more varied. Pair your heater with a pool blanket for even better efficiency and cost savings! Raypak gas heaters have been used in Australia for over 25 years and are hard to look past because they are backed and manufactured by Rheem, a trusted Melbourne brand. The Raypak units come with a digital touch pad and all the functions you would expect in a top-quality gas heater. 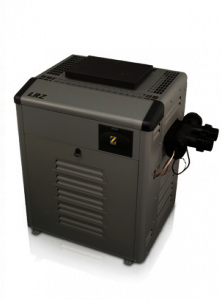 Zodiac is one of the biggest pool equipment companies in Australia and the LRZ gas heater is sure to impress. The LRZ is the only brand of gas heater we are aware of that has a tuck-away setup for the controller which makes it child friendly and well-protected from sun damage over time. Ceramic fibre combustion chamber for a lightweight, compact design. To find the perfect swimming pool gas heater for your home or business in Sydney, get in touch with Local Pool Heating. Organise a free, no-obligation consultation with our pool heating specialists today – we’ll come to you anywhere in Sydney and the surrounding area, so call us on 1300 724 132 or contact us online!